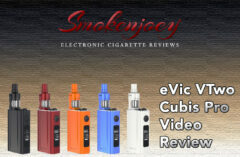 Home > Spinfuel Video > Smokenjoey > eGrip 2 Video Review – Smokenjoey! Smokenjoey Reviews the new eGrip 2 by Joyetech! Hey folks, today I’m reviewing the new Joyetech eGrip 2, or eGrip II. Here’s the official specs on the new device, and let me tell you folks, this eGrip is a major update to past eGrips. Multiple integrated safety features included. Narrow bore drip tip w/splash guard. The following coil heads are compatible with the eGrip II; NotchCoil™ 0.25ohm DL head, BF SS316 Series Heads, BF Clapton-1.5ohm head, BF Ni, BF Ti and BF RBA head.